Bluetooth, SYNC, Steering Wheel Audio Control, Air Conditioning, Power Windows! On sale now! This vehicle was originally listed at $13888. We've marked it down to $12888. You save $1000. Though the Fiesta might be small, it is still mighty fierce. 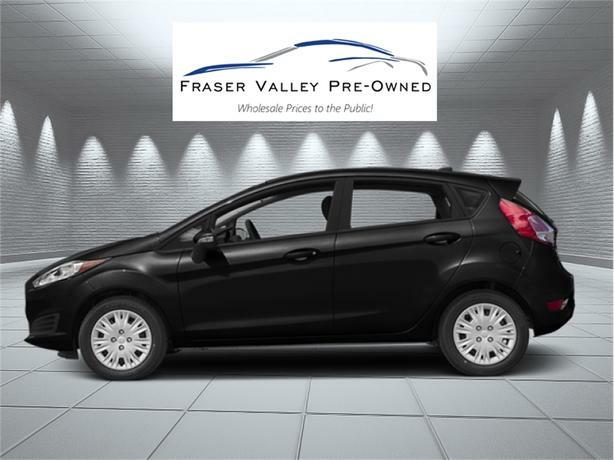 -Car and Driver This 2014 Ford Fiesta is for sale today in Abbotsford. Ford has changed what it means to be a subcompact car with the Fiesta. Cars this size used to be penalty boxes that nobody wanted to drive. This Fiesta is a different story. Fun to drive, small car efficiency, and impressive tech all in a great looking car. The Ford Fiesta is a game changer. This hatchback has 90869 kms. It's black in colour. It has a 5 speed manual transmission and is powered by a 1.6L 4 Cylinder Engine. This vehicle has been upgraded with the following features: Bluetooth, Sync, Steering Wheel Audio Control, Air Conditioning, Power Windows. It may have some remaining factory warranty, please check with dealer for details. Our Fiesta's trim level is SE. The mid-range Fiesta SE is a nice blend of features and value. It comes with SYNC with Bluetooth connectivity, an AM/FM CD/MP3 player with a USB port, an aux jack, and 6-speaker audio, steering wheel-mounted audio control, air conditioning, cruise control, power windows, and more. To view the original window sticker for this vehicle view this http://www.windowsticker.forddirect.com/windowsticker.pdf?vin=3FADP4EJ0EM113155. Buy this vehicle now for the lowest bi-weekly payment of $83.97 with $0 down for 84 months @ 4.99% APR O.A.C. ( Plus applicable taxes - Plus applicable fees ). See dealer for details.